Lowrance Elite-4 DSI has an average rating of 3.88 out of 5 based on 8 user reviews. The Lowrance Elite-4 DSI Combo is a little device packed with a lot of functionality. It comes with a dual 455/800 kHz coverage: 455 kHz for when you want broad, general scanning and 800 kHz to help you focus in on specific areas and fish. One major bonus of the Lowrance Elite-4 DSI Combo is that it features the special DownScan Imaging, which is as close as you can come to seeing the sea beneath your boat without strapping on some goggles, an oxygen tank and taking a dive. The results derived from the DownScan Imaging are so clear they appear nearly photographic, so that you can quickly and easily identify everything it picks up. You can see both hard and soft bottoms, beds of seaweed, eager fish and more. Even thermoclines are clear, so you can see the difference in the water temperatures. Additionally, it may be said that this device is one that keeps up; even going some 40 mph, clear results can be obtained. The transducer can scan as deep as 200 feet underwater. 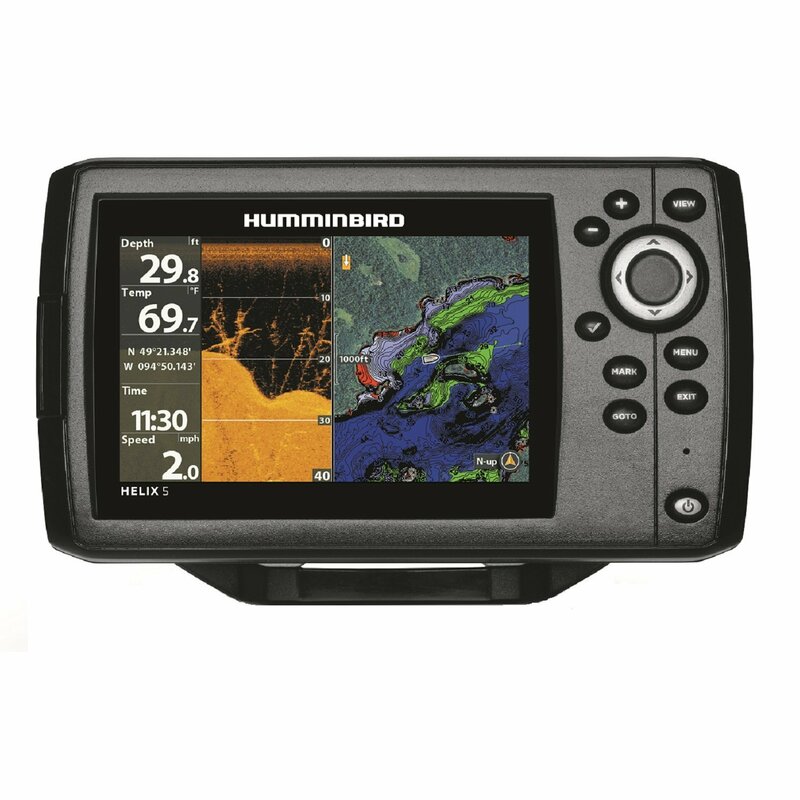 The Elite-4 Chartplotter/Fishfinder Combo is pre-programmed with a basemap; however, it also contains an SD slot so if you need something more thorough or specific, you need only load it onto the SD card for easy installation. Of course, this slot is water proof, so you don’t risk damaging anything. The device is compatible with a variety of popular chart programs, including Navonics Gold and Premium, and Fishing Hotspot Pro. The hardware is likewise impressive. The Elite-4 Combo also has a bright backlit, controls which are easy to use (even single-handedly) and a GPS antenna which provides accurate location results. The accompanying tilt and swivel bracket makes it fast to click into place and faster still to release. Sonar results are displayed on a sharp, ultra sharp 4 inch screen, perfect for any kind of eyes. As a bonus, it also comes at a reasonably affordable price, compared to others in its class. You can get a great deal on Lowrance Elite-4 DSI here. The picture is clear and visible even in direct sunlight but when you switch to split-screen, the display seems a bit too small. Overall I’m pleased with the fishfinder, great value for the money. I was impressed with the ease of use from the moment I started using my new Elite-4 DSI. I also bought South Navionics map card that has amazing detail. Thank you Lowrance, you have a customer for life. 3 years ago I bought a boat that came with an old greyscale Eagle depth finder. I finally decided to upgrade the fishfinder and purchased LOWRANCE ELITE4 DSI. What a difference!!! I can’t help but wonder how many fish I missed with that black and white fishfinder. Elite-4 is the first GPS fishfinder I ever used and I never imaged that it can make that much difference. I already found and marked a few brushpiles and that are awesome fishing spots. This fishfinder is a great alternative to expensive, big display sonars. This little device is packed with great features. The display is crisp and clear and is comparable to the larger, more expensive units. The user interface is fast, changes quickly ot the new screen. I really like the Track Back feature, I like to see what I passed over. I would recommend this fishfinder especially if you’re on a bugdet. I was able to use this fishfinder for a longer period of time on my friends boat..I was impressed that I’m going to buy one for myself. This compact unit is awesome. It was easy to install and to use. I’ve been using this fishfinder on a kayak in very rough conditions, it’s getting wet all the time. I’ve had it for 6 months and so far I haven’t had any problem with it. I’m very pleased with its reliability and how well it’s built. The display on this unit is not very vivid. If you’re planning on using this fishfinder during the day you’re going to be disappointed. Also, the quality of the DSI imaging is not as great as advertised. This GPS fishfinder is very temperamental. It locks up sometimes and it doesn’t respond to buttons being pushed. The instructions are hard to follow and technical support is no support at all. I returned it to the store.